84 (Coventry Airport) Squadron Air Training Corps: And They're Off! Throughout the month of July, the cadets from 84 Squadron will be cycling a whopping 75 miles from their unit at Coventry Airport to the Headquarters of the Royal Air Force at High Wycombe. As part of the 75th Anniversary year celebrations, Officer-in-Charge, Flying Officer Rosie Robinson has challenged the cadets to the cycle challenge without leaving the squadron building. 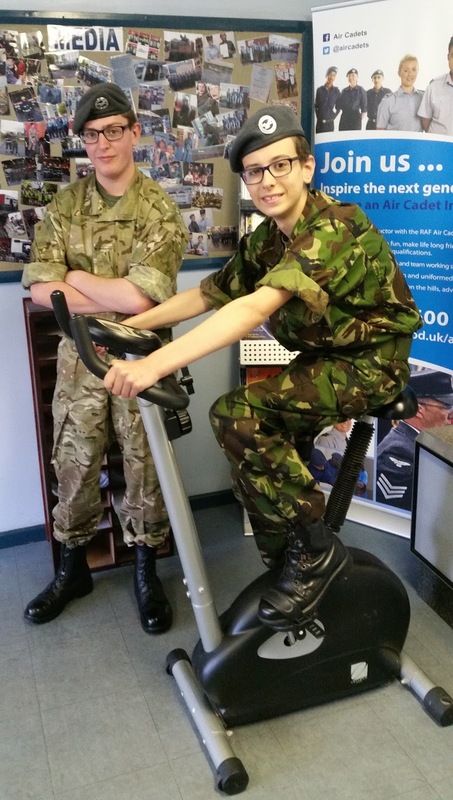 With the kind loan of a exercise bike from Civilian Instructor Sarah Kelly, cadets have planned their route and divided up the miles between the available times to ensure that a steady pace is set across the month. The route will take them south from Coventry towards Southam, past Silverstone, Buckingham and Thame before arriving at High Wycombe. Seem too easy? This has to be completed without any further disruption to the normal parade activities so whilst they rotate turns on the bike, they will carry on with normal duties and activities. Some cadets are away at different off-site activities so even less time available! 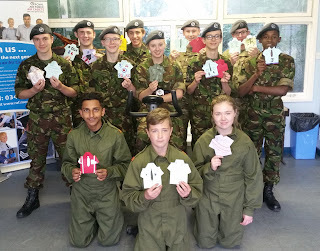 To help them along the way, the cadets made some bunting by folding paper in origami fashion to make mini-shirts which will be strung up and hung around the bike to create a fitting atmosphere. Good luck and Get Pedalling!